A year ago today I made an 8 hour road trip, partly through a blizzard in northern Ohio, to meet up with “Santa Paws” to rescue Whitby and give her a new home with me. My beloved 15 yr old Chloe had passed away in January last year and my home was so quiet and lonesome without a furbaby. 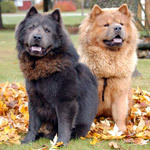 About August I started to get a nudging feeling from Clhoe’s spirit guiding me to find another chow chow to rescue. I guess Chloe felt she had been lucky to have me rescue and take care of her and wanted another chow to have that good fortune. I discovered this web site and low and behold I came across Whitby. There were some ups and downs and trying times but the rescue finally worked out . Yes! This past year has been fun, frustrating, interesting, enlightening, etc. At times she has been a real Pepsi challenge! I’ve mentioned before - I was told Whitby is named after an art museum in London, England and she is a piece of work! hehe You’ve read from time to time about her antics and adventures. The differences between Whitby and Clhoe are like night and day and that’s OK. That’s what makes life interesting. Whitby has helped to fill the void left by my beloved Chloe. That’s a good thing! Thank you to all of you here in this neighborhood for sharing a wealth of info, tips, guidance, understanding and being here for one another in good times and bad times. Merry Christmas and Happy Holidays to all of you from Whitby and me. Re: Got Cha Whitby! Thank You "Santa Paws"! Whitby you couldn't have found a better Mommy! And glad there was no repeat snow storm today! Happy Gotcha day, and thank you for rescuing. Pam ... what's amazing is YOUR transformation. Joe commented on mine just a couple days ago. When we lost Kimba I was devastated and sadly depressed. The boys have brought so much joy that Joe says I'm a different person. His eyes light up when he watches me with the boys and I can't get enough of his giggles when he's play with them. 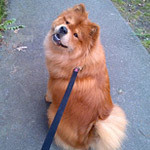 To be loved by a chow is something to hard to explain ... it has to be witnessed. I felt the sadness in your posts as you related your loss and now can see the joy. 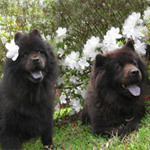 Our "girls" will always be with us (your Chloe, my Kimba), like they're sitting just beyond the corner of our eyes. And the new-found love and joy eases the pain and builds new memories to meld with the old. Happy Christmas to you and yours and Merry New Year!